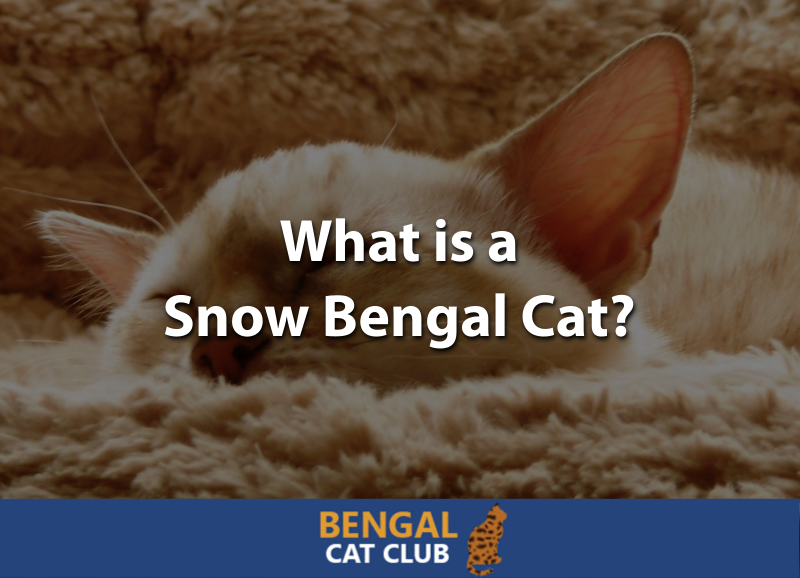 » What is a Snow Bengal Cat? Bengal cats come in a variety of colors and patterns, and with all the names, it can leave you wondering what they all mean. For example, what is a snow Bengal cat? What is a Seal Lynx Snow Bengal Cat? What is a Seal Mink Snow Bengal Cat? What is a Seal Sepia Snow Bengal Cat? What Patterns Can a Snow Bengal Cat Have? Like all other Bengal cats, a snow Bengal is the result of breeding together a domestic cat with an Asian Leopard Cat. While most Bengal cats started off as a mixture of brown, tan, and orange, some kittens were born with a recessive albino gene that left them with light-colored base coats and blue eyes. Eventually, breeders began prizing these light-colored Bengals and intentionally breeding for these colors. One breeder introduced Burmese cats into the line in order to bring out these genes and the seal-point coloring that many of them have. Also like other Bengals, snow Bengals are known for being playful, vocal, loyal cats that make great pets. This is also one of the accepted coat colors of Bengals in shows, along with brown and silver. Snow Bengals come in three different recognized colors, though they can be hard to tell apart. The best way to differentiate between these three snow Bengal colors is to do a genetic test to find out exactly what genes the cat has. Technically known as a Snow Seal Lynx Bengal, this type of snow Bengal has the lightest base coat of the three. Their base coat is a light off-white color. The seal lynx Bengal will always have blue eyes, which is one way that you can tell if that’s what you have in front of you. When it comes to the markings, the seal lynx snow Bengal cat has dark or light seal markings. The tip of their tail will feature a dark brown seal tip. Because Bengal coats are all about the contrast, this can be a truly stunning cat if they have dark seal markings over a light coat. The snow seal mink Bengal is lighter than the snow seal lynx. Its base coat ranges from ivory or cream-colored to a light tan. It may have blue eyes, however, which can make it confusing. But, their eyes also come in aqua, which makes it easy to recognize this coloring. Markings of a seal mink snow Bengal cat range from light to dark tan seal markings. The tip of their tail has a dark seal-brown coloring. When looking for maximum contrast in this coat pattern, you want to look for one on the light end of the scale when it comes to the base coat and the dark end of the scale when it comes to the markings. While this coat coloring is very similar to the seal mink snow Bengal cat, there is one distinct difference. This type of Bengal has ivory, cream, or light tan for its base coat, but it has green or gold eyes. Since this is the only type of snow Bengal that doesn’t have blue eyes, it makes them easy to spot. Snow seal sepia Bengals have markings in a variety of shades of sepia, starting with a lighter color and moving towards a darker one. Their tail tip will also be a dark seal brown in color. As with the other snow Bengal colors, it’s preferred to have one with high contrast between their base coat and markings. Now you know what colors you can find snow Bengal cats in, but what pattern their markings form is a different question altogether. All Bengals have only two options when it comes to coat pattern: spotted or marbled. Within those two broad categories, you can find a number of types of spots and marbles. While there are a few that have both spots and marbles (called “sparbled”), these are officially considered spotted. Spots come in a surprising number of shapes, sizes, and colors, each one with its own name. Spots are generally defined as patches of darker color on a lighter background. The way that the spots appear will determine what they are called. Single-spotted patterns are ones in which the Bengal has spots of just one color all over their body. In the cat show world, these are accepted but not preferred. Instead, two-toned spots known as rosettes are the favorite of judges. Arrowheads are highly sought-after in snow Bengals. These are triangular rosettes where the pointed part goes towards the cat’s tail. These are favored because they are a rare but striking pattern, especially when they are well-formed. Pawprints are ones that have a medium-color that forms a circular shape with a darker color forming an outline made up of additional spots along the edge which often resemble pawprints. This is one of the three types of rosettes that snow Bengals can have. Donuts are rosettes with a solid dark outline that completely encloses the lighter color inside. When they appear close together with narrow outlines in between, this is called clouding, named after the Cloud Leopard which has spots like this. Bengal cats that have a swirl of darker color along their back or sides are called marbled. Although they originally weren’t going to be an accepted coloring, their eye-catching beauty encouraged cat judging officials to accept them, and now marbled coats are a favorite of judges. Like spotted coats, marble coats are given different names depending on the shape and size of the marbling markings. These are: horizontal flow, reduced horizontal flow, sheet marble pattern, or chaos pattern. An experienced Bengal expert will be able to easily identify these different types of marble coats. While some marble coats may only have the markings in one color, it’s preferred to have the pattern show up with two or more color tones, much like with spotted coats and the preference given to rosettes. No matter what type of snow Bengal cat you have, you can be assured that they’ll have that great Bengal personality that is loyal and loving at all times. Do you have a snow Bengal cat? Or, are you considering getting one? Tell us about your favorite colors and coat patterns in the comments below. We’d love to hear from you!